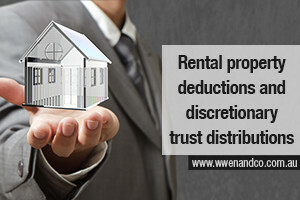 The ATO (Australian Taxation Office) is increasing its focus on rental property deductions and is encouraging all rental owners to double-check their claims before lodging their tax return. It is important for all property owners to keep accurate records. This helps to ensure they declare the right amount of rental income and they have evidence for claims made. Rental property owners should only claim deductions for the periods the property is rented out or is genuinely available for rent. If a property is rented at below market rates, for example to family or friends, deduction claims must be limited to the income earned while rented. The ATO recently completed a review of SMSF annual returns where distributions from a discretionary trust had been reported. A similar review is planned for next financial year. A discretionary trust is one in which the trustee has a discretion to determine the amount of trust income to distribute to each beneficiary. In the review, trustees were asked to check the trust deed of the distributing trust – and any resolutions – to determine whether the amount reported was non-arm’s length income. Distributions from discretionary trusts are considered to be non-arm’s length income, which is taxed at the highest marginal rate.